This question is a tempting one for brands to brush off, isn’t it? Here’s the thing, though: you can’t dismiss your follower count on Twitter as a total vanity metric. Not only does a higher follower count mean more influence in your industry, but also signals that your audience, leads and customers are interested in your content. According to social media statistics, nearly half of all marketers cite Twitter as their go-to network for engaging with customers. Fast-moving and so simple to use, Twitter is arguably the easiest social following to grow from scratch. But how do you get those followers in the first place? In this quick guide, we’re going to break down exactly how to get more Twitter followers in 2018. No bots, no spammy tactics. Just eight actionable steps you can take ASAP to attract valuable, flesh-and-blood followers. Whether you’re after more leads or just want to get the attention of big names in your industry, the following tips are totally fair game. Versus the likes of Facebook or Instagram, Twitter requires a more aggressive content strategy. According to data by CoSchedule, the “sweet spot” is anywhere between three and seven tweets per day to maximize engagement. Some brands tweet as often as 15 or 20 times per day, though, so context and competitive analysis are important here. But given how quickly the platform moves, brands can always err on the side of posting more often rather than being reserved. The key is to not only promote yourself. The good news? The possibilities for filling up your content calendar are seemingly endless. Tweets from your followers. Relevant industry articles. Buzzworthy stats. Breaking news. Personal updates. The list goes on and on. Filling up your Twitter feed with fresh content lets potential followers know that you’re active, engaging, and well, worth following. 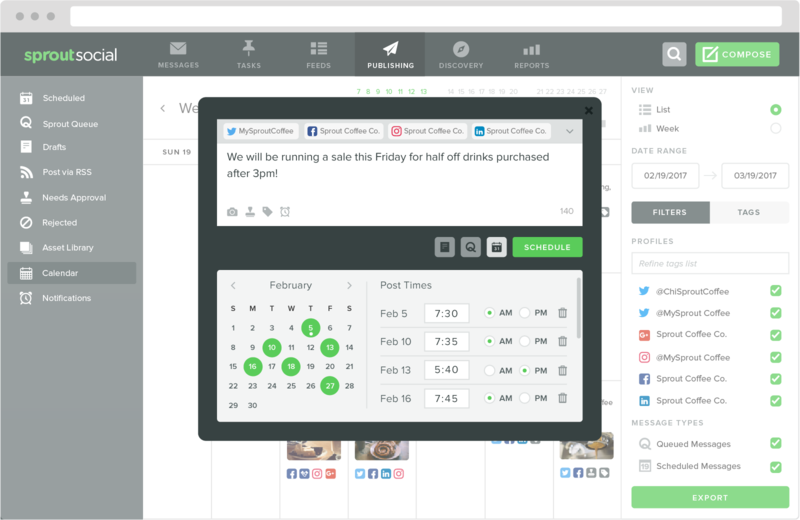 With the help of social scheduling software, you can regularly queue up content without having to constantly tweet in real-time. This effectively allows you to attract new followers around the clock. And speaking of timing, blasting your tweets while your target audience is sleeping won’t help you gain new followers. 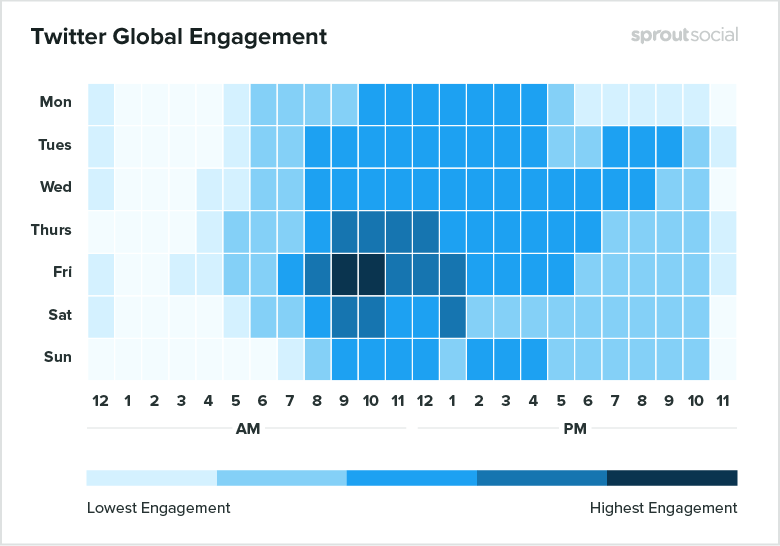 According to Sprout’s own research on the best times to post on social media, brands typically see the most engagement during weekdays in the early and late afternoons. While these numbers might vary depending on your time zone and audience, timing your tweets can help your account gain some much-needed exposure. Figuring out how to get more Twitter followers doesn’t mean sitting in front of the screen for nine hours a day, either. Ideally, brands should schedule tweets to hit the times where users are more active and tweet in real-time at intervals throughout the day as well. Not sure of when you should Tweet? 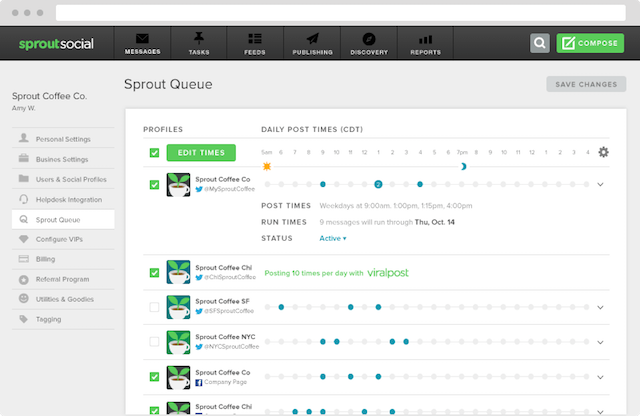 Sprout’s ViralPost automatically schedules your Tweets to be sent out when your audience is most likely to see and engage with them. As you probably know, tweets containing visual content receive more likes, shares and retweets than those without them. Whether you’re looking to inform or entertain your audience (or both), filling your feed with visual content can help bring new followers into the fold. Think of hashtags as a way to make your posts searchable, almost as a form of SEO for your Twitter account. 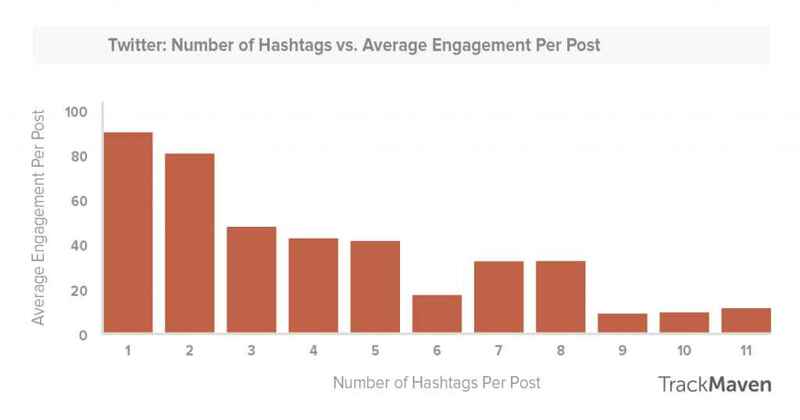 According to data and best practices on how to use hashtags, tweets with at least one hashtag receive 12.6% more engagement than those without them. Tacking on a couple of hashtags to any given tweet is a quick way to increase the likelihood of new followers finding your account. Plus, doing so only takes a couple of seconds and there are plenty of hashtags to choose from. The only caveat with hashtags is that you don’t want to go overboard. Posts brimming with hashtags look spammy at a glance and are otherwise distracting. And besides, spamming isn’t necessary when you know which of your hashtags attract the most followers. 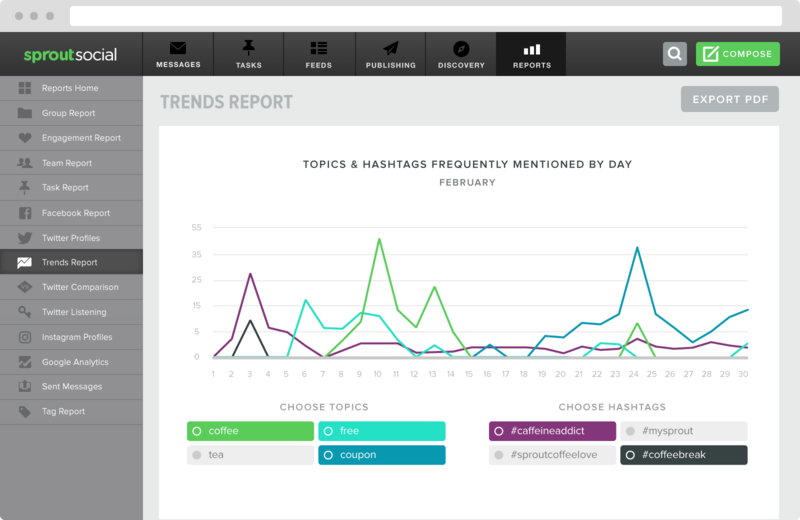 By taking advantage of Twitter analytics, you can dig deeper into the top-performing tags for your particular brand. Getting more followers on Twitter doesn’t have to be a time-sink: it just means making the most of the time you spend on the platform. Sure, you can and totally should schedule tweets to optimize engagement. But at the same time, you don’t want your Twitter account to look like it’s completely run by bots. You need to get in the trenches with your followers, customers and industry leaders alike. 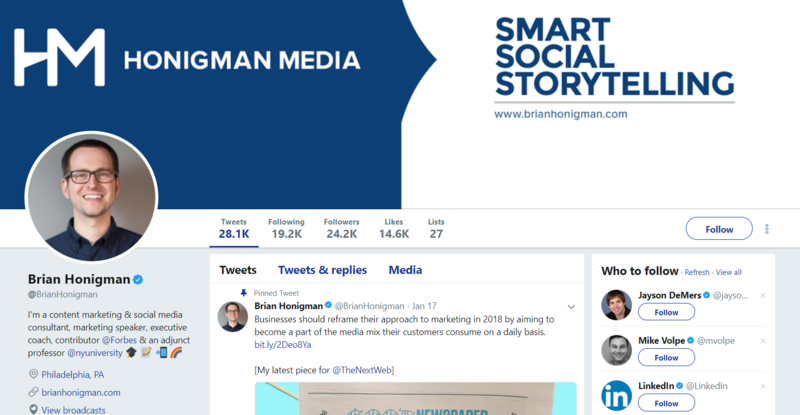 Regularly engaging with other users via tagging, retweeting and replying immediately lets new followers that you’re human and gets more eyes on your brand. For starters, let’s say you’re replying to another brand’s tweet to try to get their attention. Writing out a detailed, thoughtful response will score you more potential followers than a brief one-word reply. 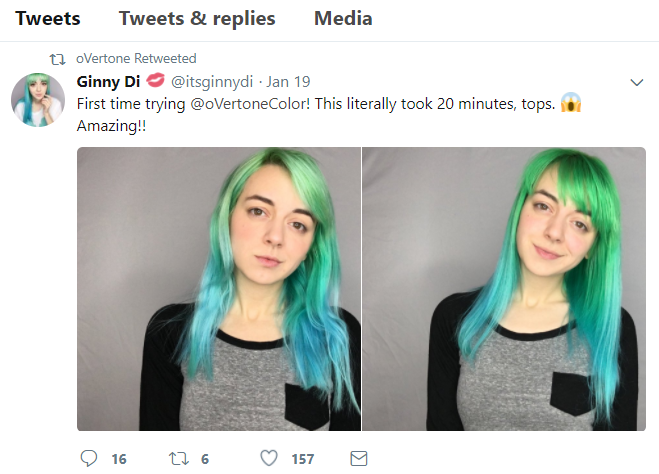 Another smart way to get other brands interested in your account is by shouting them out. Tagging other brands as a compliment is a popular tactic to show some love to others in your industry. In turn, they might give you a shout out as well. Likewise, being tagged in a tweet can help you tap into new audiences by understanding who else is sharing your content. If you want to be tagged by others, you should do the same yourself. These small pieces of your content strategy contribute to the bigger picture of attracting followers. Any combination of tagging, retweeting and replying don’t have to take long but are essential to letting those potential followers know you’re active. Considering that up to 15% of tweets are suspected to be bots, brands need to do everything they can to prove they’re human. 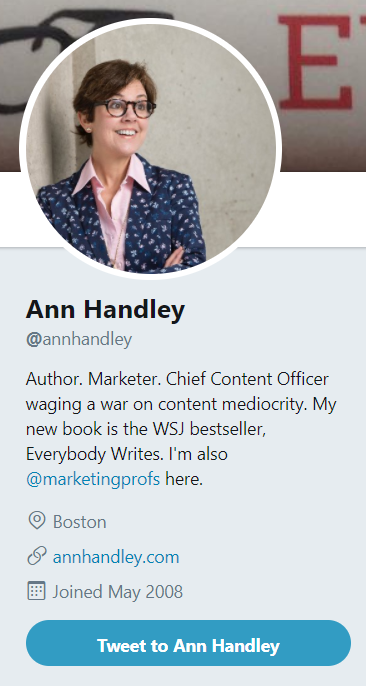 In addition to a diverse content strategy, there are a few subtle steps to make your profile friendlier to new followers. A clean profile photo. According to the psychology of social photos, an unobstructed facial photo is ideal if you aren’t using a high-res brand logo. Relevant tags, industry keywords and location information. In short, your profile should be “complete” through describing what you do, your title, what companies you work with and where you operate. A taste of your personality. Giving your followers a sense of who you are is always a plus. Simply put, fine-tuning these pieces of your profile help guarantee a positive first impression with new followers. Here’s a simple, straightforward tip for gaining some new followers and making yourself more visible in Twitter’s search in seconds. If you’re like most people, you’re hesitant about uploading your contact list to any social network. 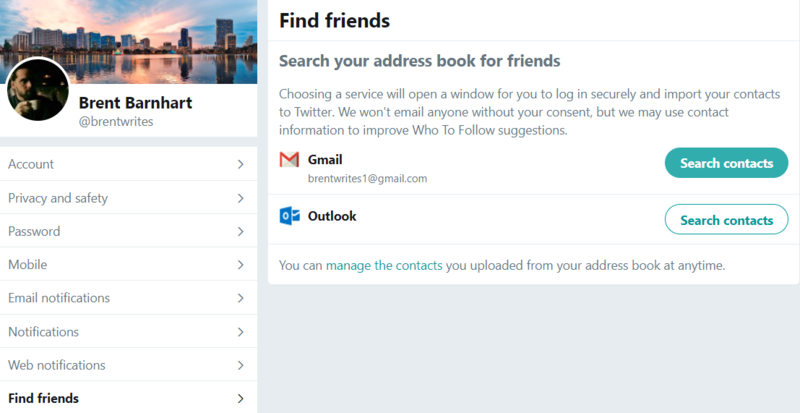 However, syncing your contact list to Twitter can help you tap into your existing network of people most likely to follow you. If your synced contacts are on Twitter, your account has a higher chance of showing up as a suggestion under the “Who to Follow” section. Depending on the size of your contact list, this can score you a lot of new followers with very little work on your part. The last piece of winning more Twitter followers means promoting your profile beyond the platform. 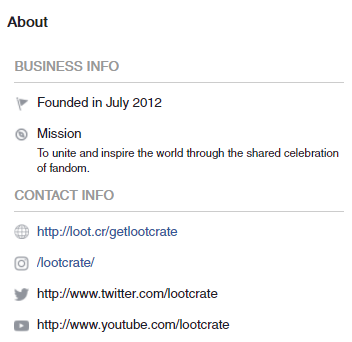 Let’s take a quick look at how Lootcrate advertises their Twitter account and other social profiles throughout their site and marketing campaigns. 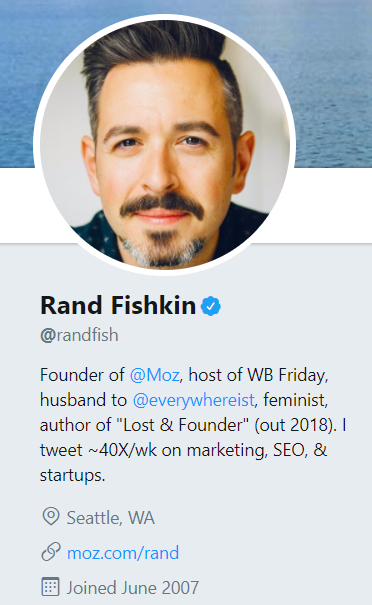 Considering how commonplace Twitter is for marketers in general, there’s no shame in plastering your profile wherever you can to help encourage new followers. 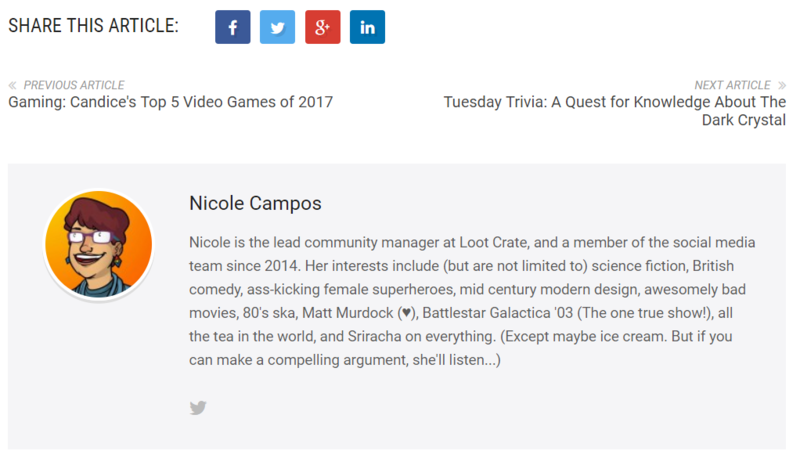 And on a final note, Lootcrate also provides a good example of how bloggers can encourage readers to get in touch via Twitter. This is especially valuable if you frequently guest post on other sites and want to turn those one-time readers into long-term followers. And that wraps up our list! What Are You Doing to Grow Your Twitter Following? Growing your Twitter following doesn’t happen by accident. A combination of planning your content, engaging with fellow users and optimizing your profile is key to attracting new followers. If you’ve been struggling to figure out how to get more Twitter followers, start with these steps. Many of them only require a small commitment of time but can make all the difference in terms of new leads, customers and exposure for your brand. And on that note, what kind of traction are you seeing on Twitter these days? Anything special you do to bring in new followers? Let us know in the comments below!